Heat oil in frying pan with deep sides and saute onions for 2 minutes. Add cumin and chili powder, sauteing another 2-3 minutes. Add tomatoes with juice, drained beans, and chiles to onion mixture and simmer for 20 minutes or until slightly thickened. While mixture is simmering, preheat oven to 450 degrees and spray a 9x13 pan with cooking spray. Spread about half of the bean mixture in 9x13 pan, then carefully break eggs over the top. Spread remaining bean mixture around eggs, being careful to not cover the yolks. Bake for ten minutes or until eggs are starting to look set, but are still wet. Remove pan from oven, change settings to broil, and sprinkle cheese over the top. Place pan back in oven for 2-3 minutes or until cheese has melted. Remove from oven while yolk is still a little bit soft. Serve with optional garnishes. Notes: We use crockpot beans (pinto/black combo) I've previously cooked and frozen instead of canned beans. We all hate runny eggs, so ours are cooked, but still soft. 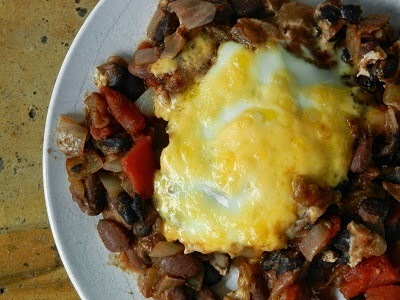 All the Ws like this dish better when we use a bigger pan (I think it's 10x15, but I'm not sure) and put all the beans on the bottom instead of putting half around the eggs. You can check out the link to Kalyn's Kitchen at the top of the post to see directions for making this in individual dishes. Serve this with Mexican layer salad for a complete meal.